Velocity Credit Union is based in Austin and has served the area since 1947. It is one of the largest financial institutions in the state of Texas with over $840 million in assets, and provides personalized banking to more than 84,000 members across six local branches. Velocity takes pride in making its members feel valued, and in creating a positive customer experience, however their current service offering was not meeting these goals. Velocity was struggling with long hold times and a high number of abandoned calls. 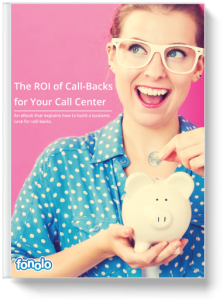 They thought they had to replace their legacy call center system to correct this problem – which would be costly and time consuming. To solve these problems while leaving their current call center infrastructure intact, Velocity considered a cloud-based call-back approach. They turned to Fonolo’s In-Call Rescue solution, which gives callers the option of receiving a call-back when hold times are too long. Now members can simply “press 1 for a call-back” while Fonolo holds their place in the queue, eliminating hold times for members and ensuring an improved call center experience. 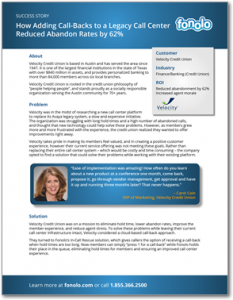 Read the success story to learn how they reduced abandon rates by 62%, alleviated caller frustration, and increased agent morale.